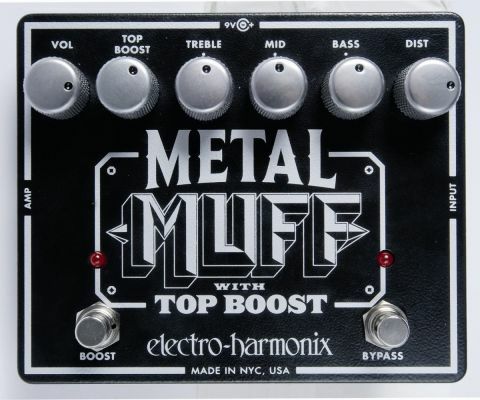 Bring the noise with this metal-themed fuzzbox. The Metal Muff is a somewhat different proposition that may well appeal to alt rock guitarists and extreme noise terrorists as much as - if not more than - conventional metallers of the old school. That said, if you want to make your solos spit molten attitude and your riffs throttle the audience, give the Metal Muff a spin. Raunchy overdrive to fully saturated filth. Top boost really cuts through. Arguably not the first choice for those chugging, palm-muted metal rhythms. Along with Tube Screamer-style overdrive, fuzz is one of the most common boutique effects, with people prepared to shell out big bucks to tone gurus with the promise of capturing the classic sounds of their heroes in a roadworthy unit. Inevitably, a pedal as iconic as the suggestively monikered Big Muff Pi hasn't escaped its share of high-spec imitators. In recent years, this has often been in response to the inflated price of vintage examples, along with perceived shortcomings in modern reissued pedals. The newest addition to the Muff stable, the Metal Muff (or Metal Muff With Top Boost to give its full title) looks fantastic thanks to its spiky take on the classic logo and its striking black and chrome livery. Although most players will associate Top Boost with Vox amplification and all things '60s, Electro-Harmonix has included the feature with a view to ensuring that those riffs and solos scythe through a dense mesh of dirty rhythm guitar. Sharing much of the rugged construction of its stablemate, the Little Big Muff, only with a larger case and a pair of footswitches, the Metal Muff is a sturdy beast. The amp-style knurled metal knobs look great, but don't grip the pot shafts quite as tightly as the plastic counterparts found on its sibling. Battery access is achieved by removing the four screws that secure the base plate to the housing, and although the Metal Muff has a slightly more complex circuit than a regular Big Muff, you can still expect the battery life to rival the Duracell Bunny. It's quickly apparent that the sweep on the equalisation controls is very broad, with the bass control delivering 14dB of cut and boost, the mid control 15dB and the treble control 10dB. With the tone pots set to zero, there's no sound at all, but that certainly changes as you rotate them clockwise. The distortion level without the Top Boost engaged varies from a raunchy retro drive with just a hint of fuzz around the edges at the lower reaches of the control's range to full-on, searing distortion. Although there's tighter bottom-end control than with a regular Big Muff, proceedings can still get pretty messy, and it's not a contender for James Hetfield-style palm-muted rhythm playing. The Metal Muff on full tilt is better suited to J Mascis-style angular lead playing, stoner rock riffing and creating a formidable wall of dirt.